The lovely Jerusalem cookbook gave me the courage to throw caution to the wind and experiment with barberry. These tiny, tart but flavourful crimson dried berries are heaped with praise and sprinkled into numerous recipes throughout this acclaimed book. Uncommonly delicious recipes don’t get any easier than this. 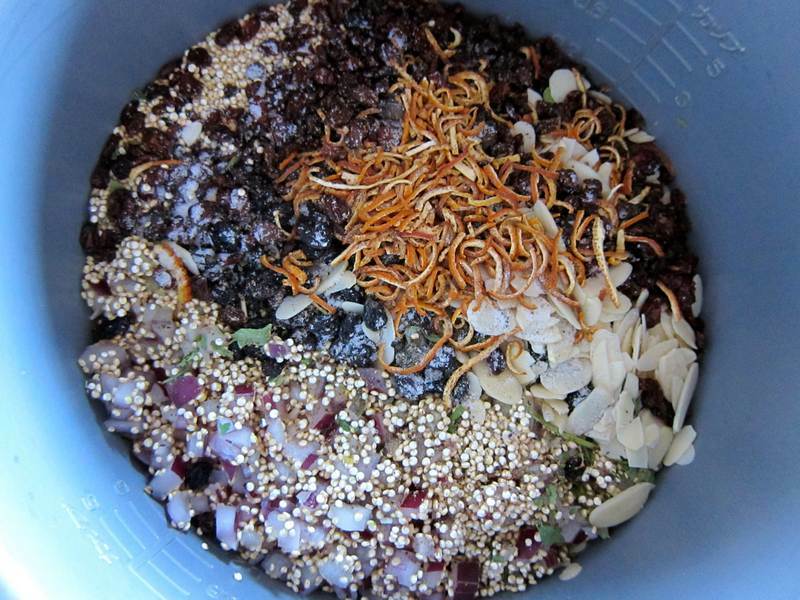 If you have a rice cooker, you can wander off and take a bath as the Barberry Quinoa cooks itself. Or you can schlep your rice cooker fully loaded with the ingredients to your next potluck and plug it in to begin cooking 30 minutes before main course time. Voila! Don’t you look clever. Combine all ingredients in a medium sized pot or a rice cooker. Bring to a boil, then simmer until all the liquid is absorbed. Add the butter, dill and mint to the hot cooked quinoa. Taste to adjust seasoning. Serve hot or warm. Garnish the platter with sliced oranges. Can be served on a bed of arugula that is lightly dressed with vinaigrette, and a side of roasted salmon. Serves 6-8. The Jerusalem cookbook includes a recipe for peace. The authors, Yotam Ottolenghi and Sami Tamimi, bridge the gap over their divided cultures through their love of food and their quest for a common understanding. Their wish is that food can act as a catalyst to bring people closer together. Amen. L’italien is a touching spoof of a movie that exposes racism and the lengths people go to in order to fit in and succeed. It serves as a good reminder to self search for prejudice and to treat everyone with respect and fairness. 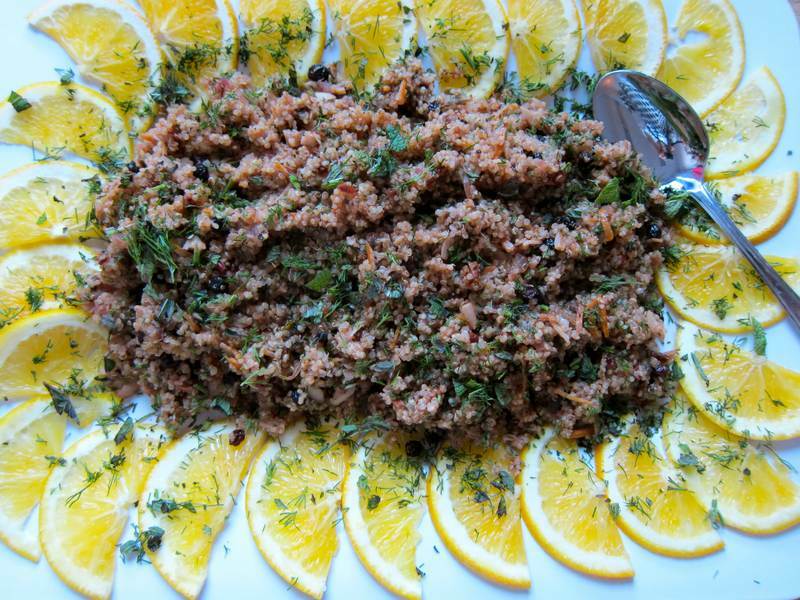 Wondering where to find the barberry, dried orange peel and dried mixed fine herbs? The Iranian Marché Alborz (6685 Rue St-Jacques, Montreal, 514-692-2049). You’ll find wholesale priced, top quality, preservative-free foods and wonderful fresh nuts. Hi Holly, You may recall that at the book club last Wednesday we were discussing things we buy at our local Montreal NDG Iranian store, Akhavan. I buy Zereshk (زرشک) which is the Persian name for barbary. 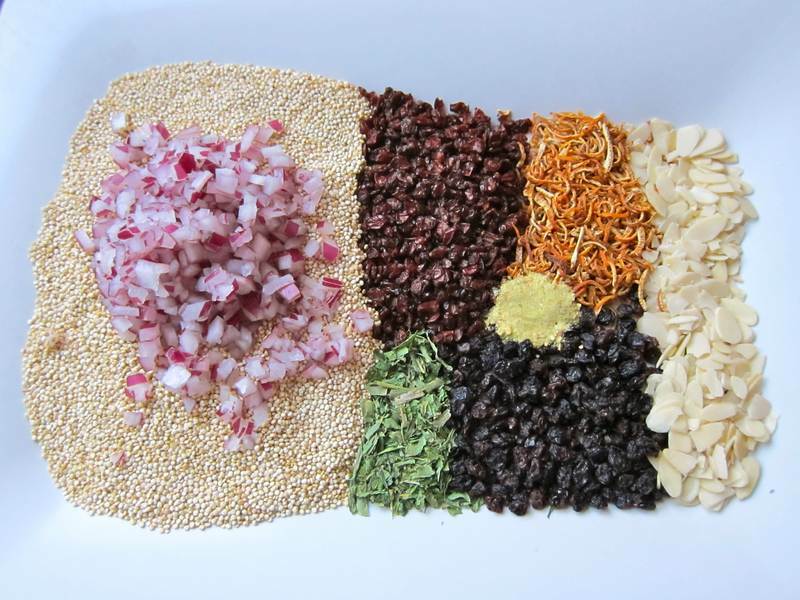 I throw it into salads, rice, all kinds of things, so its great to have a Quinoa recipe where I can use it as well. Of course they also sell dried orange peel. Good point Joan. 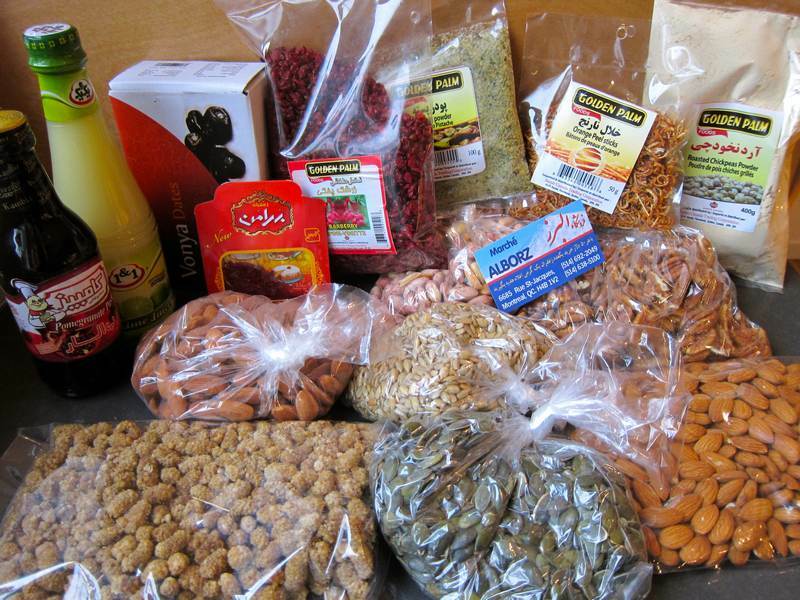 Akhavan is very well known and a great place to get Persian ingredients. Do you cook the barberry along with the rice or toss it in after cooking? Holly, I am so excited to own this book. Tried the roasted chicken with clementines and Arak this weekend and couldn’t stop oooohing and aaahing. All the recipes look so delicious and earthy including this one. Let me know how other recipes turn out. Can’t wait to cook my way through this cookbook. Happy Cooking! Happy Cooking to you too Sonia. It is a really enticing book. I’m also looking forward to lots of experimenting. I loved your post. I happened to have bought barberries to use in recipes from Jerusalem. I was too lazy to consult the book to see if the recipe was from there. Is it? Also, are the mixed dried herbs worth seeking out? And where on St Jacques is the grocery store you mentioned-is it better than Akhavan? Is this recipe as good as it looks? Thanks for liking the post. Yes the recipe is as good as it looks. It was gobbled up at 2 potluck parties this past week. The recipe is my creation. I can’t tell if the dried herbs are important. I’ll bring them to work and show them to my Persian friend and ask her. Store is pretty cool. Much smaller than Akhavan – across the street from Loblaws. Easy to get to – easy to park – like a little strip mall. They have some interesting products. Hi, Holly. I agree that Jerusalem is a terrific book: love it!! I cook a lot of quinoa and prefer the red variety to the beige. Colour is prettier – a kind of rust – and the texture is slightly coarser. Also, I use less water than the 2:1 ratio most recipes recommend. A chef once told me that a good way to make quinoa is to start with equal amounts of quinoa and water and then to add more water a bit at a time, the way you’d add liquid when making a risotto. Works for me. I love the idea of adding water slowly to get just the right texture. Thanks for the good advice! Great article in the Gazette today.